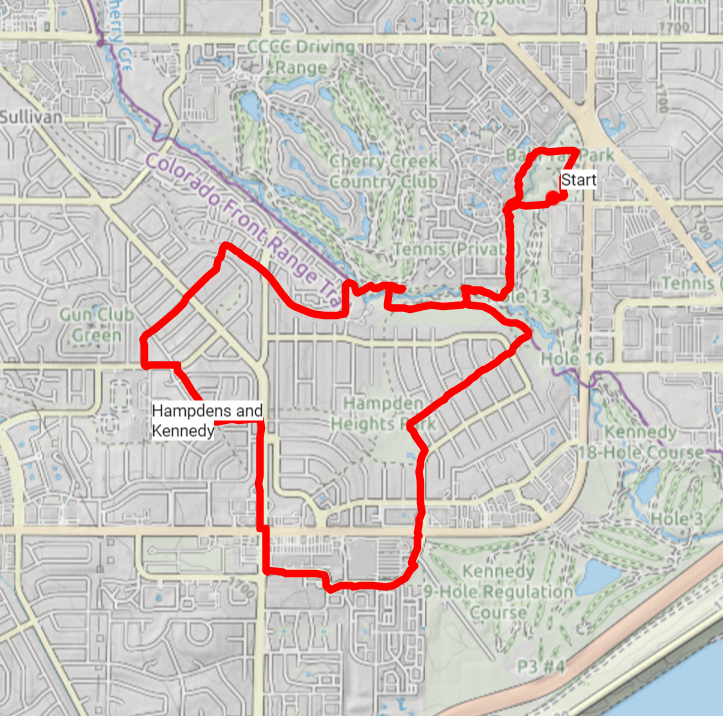 With three neighborhoods right next to each other making a u-shape, I decided to combine Hampden, Hampden South and Kennedy into one big, 5-mile walk. 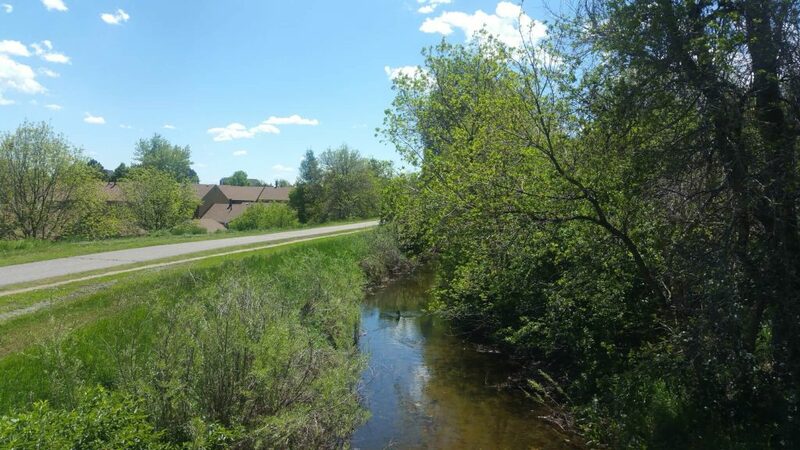 With not much history to explore, but some great trails and parks within, this 6-mile urban hike finds some fun sights and interesting creek crossings. The neighborhood of Kennedy isn’t much of a neighborhood. With just a few multi-family dwellings, it’s biggest perk is being next to the Kennedy Golf Course and the Kennedy ball fields. Named after JFK himself after a sweet visit to Denver, Kennedy Park sits right next to Cherry Creek Reservoir as well. So if you’re looking for something to do outdoors, you’ve got quite a selection between golf, baseball, soccer, hiking, swimming, boating, and just plain old adventuring. Kennedy neighborhood boundaries are Dartmouth, Peoria, I225, Dayton, Hampden. 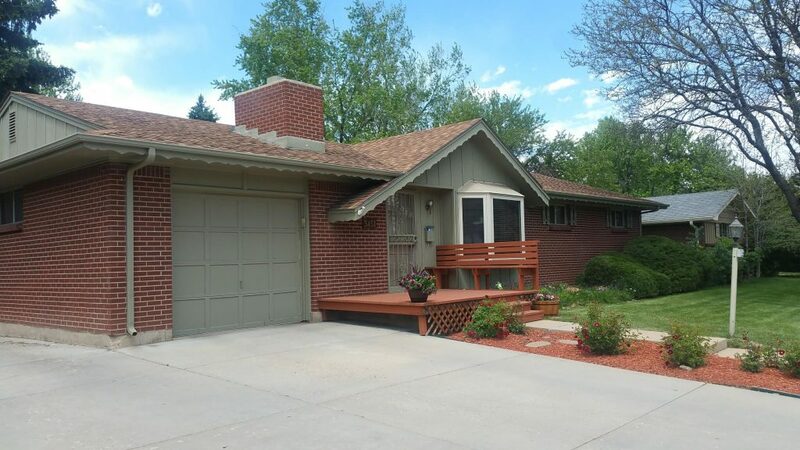 Hampden Neighborhood, sitting to the west of Kennedy, homes some of south Denver’s great parks and trails. 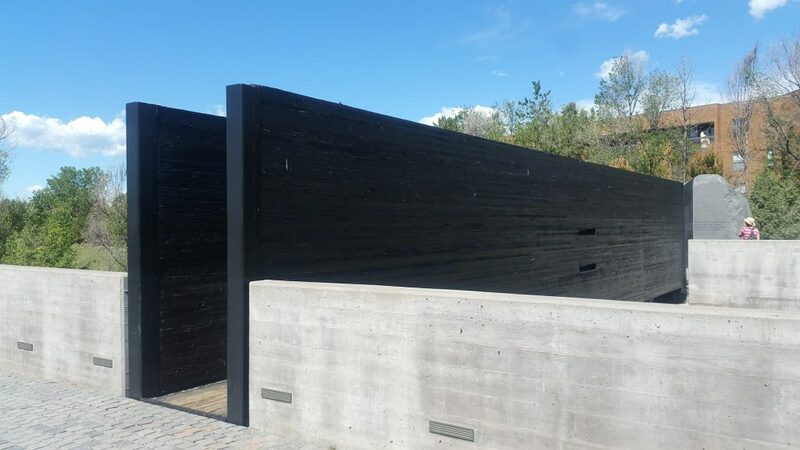 Including Babi Yar Park, Hentzel Park and Bible Park, you can actually meander through them via the Cherry Creek Trail and the High Line Canal Trail plus a couple of local trails, which we did. (See the route below.) Hampden homes are mostly split level late 1960s to early 1970s and make up the Hampden Heights neighborhood. Hampden draws its boundaries to the east of Glendale, and roughly includes the area of Hampden, Yale and I25. South Hampden sits south of Hampden with a commercial strip between the two along Hampden. The boundaries are roughly Hampden, I25, Yosemite and Belleview, and the neighborhood does jump I225 to the southeast and includes the I25 and I225 interchange. 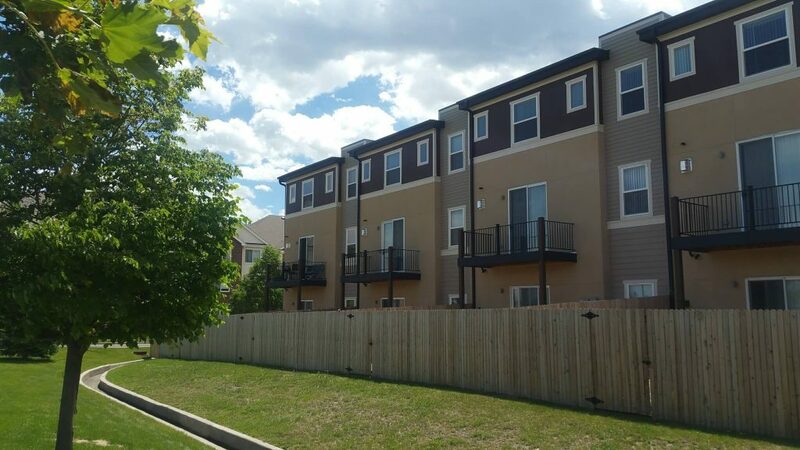 Denver Tech Center (DTC) and Rosamond Park call Hampden South home. Within these three neighborhoods, you can jump on one of several regional trails to get out of town. The Cherry Creek trail runs from the confluence of the Platte and the Cherry Rivers downtown to south of Cherry Creek Reservoir. The High Line Canal Trail runs from Waterton Canyon to Green Valley Ranch. 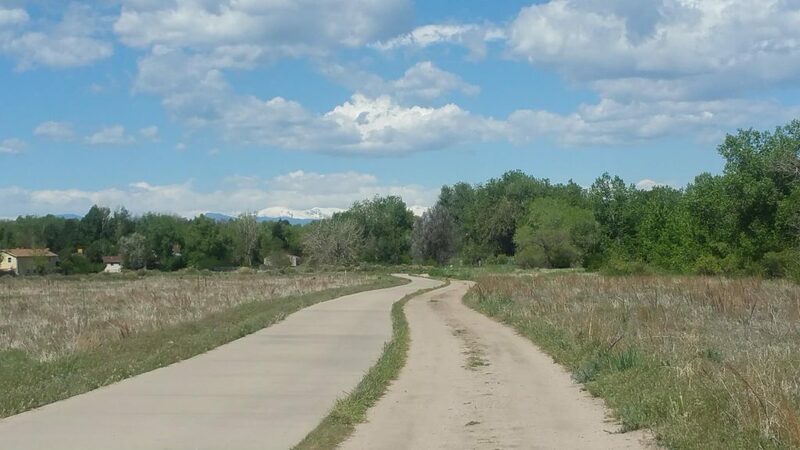 Get on either one of these trails, and you can access over 300 miles of regional trail all along the front range. In addition, many local trails connect to these regional trails, so your adventure could continue forever! In addition to the great trail system, there are plenty of parks, too. From James A Bible Park (named after a Denver Parks and Rec maintenance worker) to Hentzel Park (lots of controversy there!) to Babi Yar (a must-see memorial to the Ukrainian Jews killed in the Holocaust), you could easily spend a day just enjoying the parks. Regardless of whether you want to visit the neighborhoods, the parks or the trails, this route covers them all. Start at Babi Yar Memorial Park, where the address is 10451 E Yale Ave, Denver, CO. Spend some time in the park, enjoying the memorials and information within. As you meander the park, make your way toward the northwesterly corner where there is a sculpture evoking the holocaust trains. Behind the sculpture is a trail leading to the west and out of the park. Follow the trail to the south across Yale. You’ll see a green space on the south side of the street behind patio homes. Although this is no official trail through this area, it is open space and publicly accessible. Walk south along this area. You’ll have patio homes on your right, and you’ll start seeing the Kennedy golf course on your left. You’ll come to the end of the open space as it skirts the golf course. The row of patio homes will go to the right. Look for a social trail that follows the patio homes on your right and the Cherry Creek on your left. 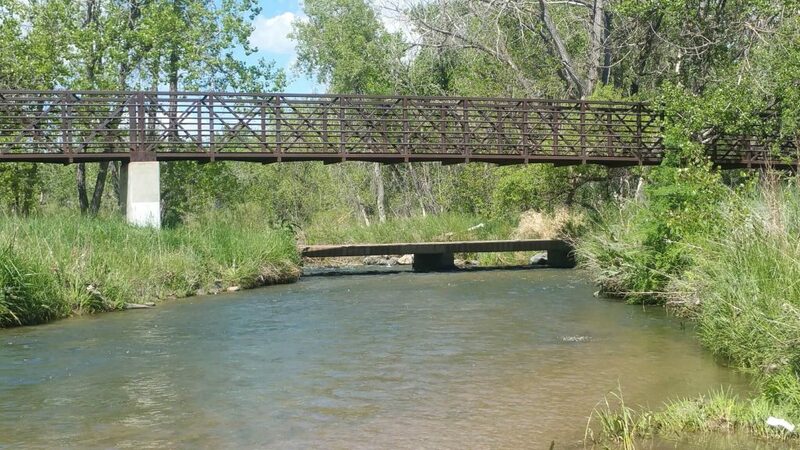 Walk about 1/3 mile to a bridge that crosses Cherry Creek. Cross Cherry Creek. Walk a short distance to the main Cherry Creek trail and take a right. Stay on the dirt trail as bikers through here are quick and frequent. You’ll come to the intersection of the Hampden Heights trail and the Cherry Creek trail. Stay on the Cherry Creek, veering to the right and heading north. You’ll come to where the High Line Canal goes under the Cherry Creek. If you’d like to take a right on the High Line and look at where the Canal goes under the Creek, do so. When you’re ready, take a left on the High Line Canal Trail, following the signs for the High Line Canal West. Stay on the High Line Canal Trail, crossing Yosemite. The next bridge is a neighborhood bridge into Hampden Heights. It’s green, crosses the Canal, and comes out at South Willow Court. Take that bridge and continue southwesterly along Willow Court. Cross South Syracuse Way. Willow Court becomes S Willow St. At E Dartmouth Ave take a left. Dartmouth turns into S Xenia St. Continue a short way until you see a local neighborhood trail across the street to the right. It’s asphalt and goes up the hill. Walk about a 1/4 mile until you come to the Hampden Heights trail, take a left. Follow that until you come to S Yosemite St. Take a right. Follow Yosemite across E Hampden, crossing into South Hampden neighborhood. Take a left on E Jefferson Ave.
Jefferson Ave will turn south then east then north. When it turns north, it becomes S Dayton St. Kennedy Golf Course and its small neighborhood across the fairways will be on your right at that point. Cross Hampden again. Continue north. Right before you get to S Dayton Court, you’ll see a trail on your left. This is Hampden Heights trail. Take a left onto the trail. About 1/4 mile in, the trail come to a T. Take a right on Hampden Heights trial, walking through the neighborhood, with homes on both sides of the trail. The Hamden Heights trail dead ends at the Cherry Creek Trail. Take it to the left. Walk about a 1/4 mile, and you’ll be back to the spur your originally took to cross the Cherry Creek. Take a right on the spur, cross the bridge, then turn right on the social dirt trail you took at the beginning of the walk. Continue along the dirt trail with the patio homes on your left and the Kennedy Golf Course on your right. Continue north up the open space. At Yale, take a right, and Babi Yar Memorial Park will be up on your left.